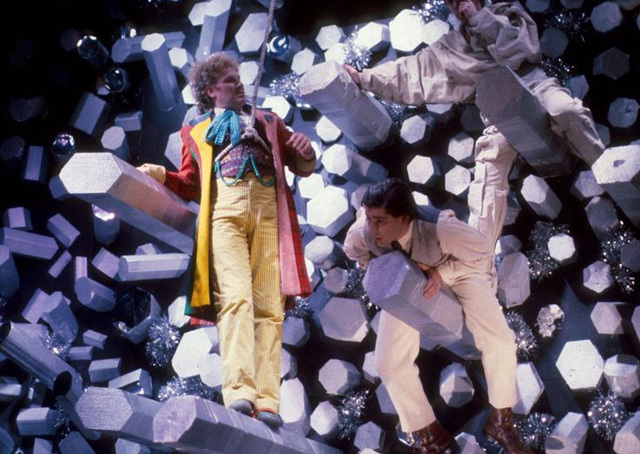 1985 - Doctor Who: Revisiting TIMELASH | Warped Factor - Words in the Key of Geek. Tony Fyler prepares the Timelash! Full disclosure – I like Timelash. I’m one of about six Doctor Who fans in history, but I do. Like previous story The Two Doctors though, it’s one that’s better as a novelisation than it is on screen, though not for the same reasons. 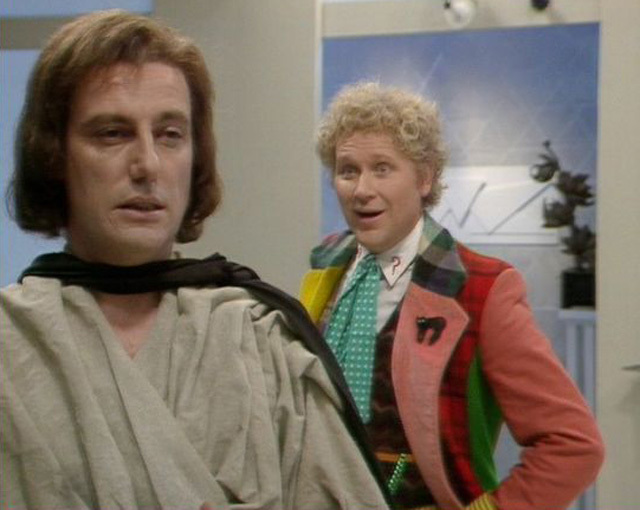 With The Two Doctors, the novelisation allowed for the clarification of ideas that were lost on screen. 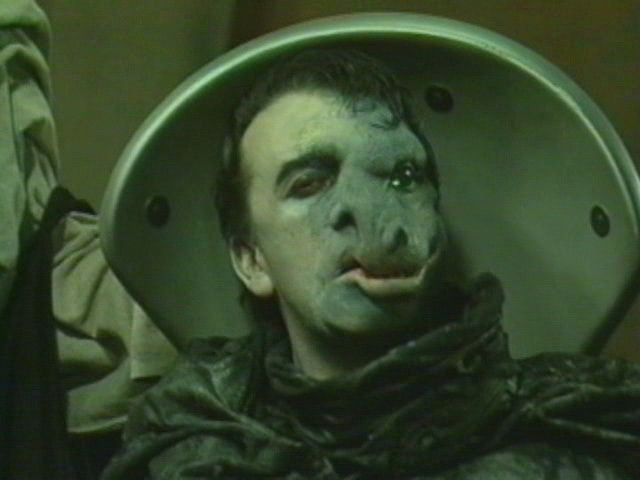 With Timelash, the novel allowed writer Glen McCoy to repair the damage of a non-existent budget and occasionally stilted (or in one case, massively over-the-top) performances, giving the world of Karfel a consistent internal logic that the on-screen version was denied. Talking about Attack of the Cybermen and the rapidly approaching ‘rest’ the Sixth Doctor was ignominiously given, my colleague Matthew has mentioned that the series got a viewer-bump for the first episode of Timelash, because by the time it was broadcast, the announcement of the ‘hiatus’ had been made, and people tuned in to see why a longstanding cornerstone of the British TV schedules was due to be taken off the air. They may not have watched it for years, but much of the British public felt better ‘knowing it was there,’ in much the same way as they supported arts programming on the BBC, without ever having to actually sit through it. It’s conceivable that the backlash from fans would have carried more weight from casual viewers, had the episodes the British public tuned in to see…not been Timelash. When the viewer-bump came, it’s possible that Britain’s nostalgic love-affair with Doctor Who froze, casual viewers feeling like after all, Doctor Who was the things the BBC heads said it was – tired, uninspired, unable to keep pace with American imports. They may have thought that because the budget simply wasn’t there to deliver the scope of Glenn McCoy’s vision. The story had snarling monsters in it, and Doctor Who hadn’t done well in recent years with snarling animalistic monsters – even The Caves of Androzani’s Magma Beast was a bit naff, to say nothing of The Mark of the Rani’s cheap-looking Tyrannosaurus Rex. The Morloxes looked like puppets, plain and simple. The Borad, the half-Jekyll and Hyde, half-Phantom of the Opera baddie at the heart of the story, looked like a bloke with a demented rubber mask on and a dodgy flipper. The flat, grey-white, uninspiring surfaces of Karfelon architecture, which in the script had a logical reason for being the way they were, just looked dull and cheap, and the Timelash itself, the MacGuffin to which all eyes were necessarily drawn by virtue of it being the only thing with any shine in the place, looked like a big cardboard box lined with aluminium foil. Sadly, it was all too clear that the reason it looked like that was that that was what it actually was. Even inside the Timelash, things didn’t improve – outcroppings of dull plastic crystal, interspersed with twinkles of tinsel did not make for the terrifying, world-enslaving threat the script called for. The performances too, while having a point in the script – Karfel was supposed to be, like Traken before it, a world run by calm, polite aristocrats, hence their generally unruffled and reasonable demeanours – came across as relatively flat and dull on screen, the casual viewer easily able to mistake the intent of the author for the incompetence of the actors because the world was not sold to the audience clearly enough. The performances came across as flat and dull of course with one dazzling exception. Get Paul Darrow in anything, and you have that voice, that way with snideness, and that sudden ‘I could bite your head off right now if I wanted’ smile. In Timelash, he hams it up shamelessly as Tekker, and gives us what amounts to his outer space Richard III (as famously overplayed by Laurence Olivier). The really weird thing about that is that in an environment so otherwise flat and grey and devoid of sparkle, it actually works. Darrow’s performance may be massively over-the-top, but by the gods, he gives you something to look at. His quest for power is exquisite, like Olivier’s original, as he betrays everyone around him with a verve that gives Timelash much of its movement. Only when the true extent of the Borad’s plans is revealed to him does Tekker make a stand – and it immediately costs him his life. If you’re not watching Darrow, chances are you’re watching David Chandler as Herbert, who brings his own sense of clueless chivalry to the story. Particularly in scenes with Colin Baker, Chandler pulls off the unusual double of being a bit pompous but still loveable, infusing Herbert with a kind of curiosity and enthusiasm that makes the reveal of who Herbert actually is sweetly believable to anyone who’s read any of ‘his’ work. Peri: Doctor? That curve on the screen you asked me to keep an eye on? It’s now a straight. Is that bad? Doctor (practically buried in Tardis wiring): Bad? No. It’s disastrous. But to casual viewers tuning in, what was most visible were flat colourless walls, a cardboard and tinsel MacGuffin, an overacting baddie, a high-handed hero, a dodgy monster, an equally dodgy bloke in a weird mask, secondary characters you didn’t believe had the spark in them which their actions demanded they have – and oh yes, the Bandrils, another alien that looked like a dodgy puppet, because it was a dodgy puppet. If you were tuning in to make your mind up about modern Doctor Who and assumed it was all like Timelash – well, let’s just say the desperately fan-madness vibe of things like Doctor In Distress makes a good deal of sense, as mainstream casual viewers seemingly decided that Doctor Who wasn’t especially worth saving after all. Timelash though, thirty years on, deserves a re-appraisal. The ideas for a cracking Doctor Who story were there. McCoy’s vision of Karfelon society needed more bedding in, and almost everything needed to be scarier – the Timelash, the Morloxes, the Borad (Paul Darrow? Probably scary enough, thanks). And most crucially, it needed more money spent on its effects budget, and ideally more androids, to sell the whole thing. But in a few key performances and its underlying structure, Timelash stands the test of time better than you might think.